This false-color image taken by the panoramic camera on the Mars Exploration Rover Spirit shows the rock dubbed "Humphrey" and the hole drilled into the rock by the rover. 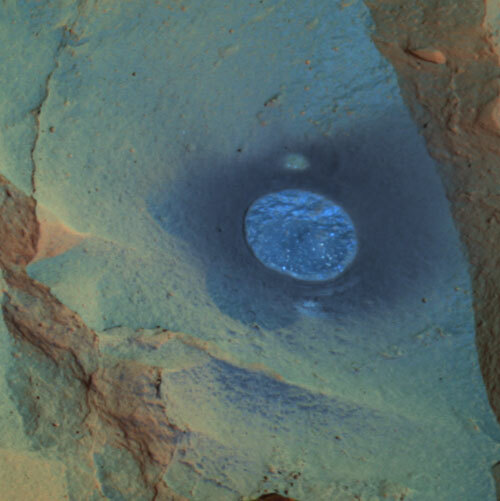 Spirit ground into the rock with the rock abrasion tool located on its robotic arm on the 60th martian day, or sol, of its mission. Scientists are investigating the freshly exposed rock with the scientific instruments on the arm. Spirit is about halfway to a large crater nicknamed "Bonneville." This image was made by combining data from the camera's different wavelength filters. The particular filters used were chosen to enhance features of scientific interest. Did you lose your way on google?